A total 150,400 people were counted in the Erongo Region during the 2011 National Census, which is 7.1 percent of the total population of Namibia of 2,104,900. During the 2001 National Census the Erongo Region had 107,656 people, accounting for 5.9 percent of the total population of 1,830,293. The Erongo Region counted 44,900 households in 2011 at an average size of 2.6 people per household, while in 2011, while in 2001 the region had 27,496 households at an average size of 3.8. According to the 2011 Census the population density was 2.1 persons per km2, compared to1.7 persons per km2 in 12001. 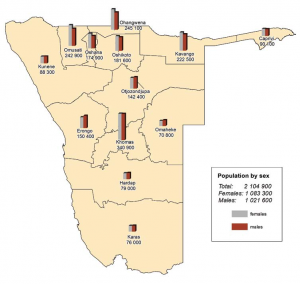 In 2001 the Erongo Region had 50,040 females and 57,616 males, or 115 males for every 100 females, growing at an annual rate of 1.3 percent. The fertility rate was 3.2 children per woman. Then 80 percent of the population lived in urban areas while 20 percent lived in rural areas. The figures for 2011 are not available as yet. In 2001 by age, 11 percent of the population was under 5 years old, 18 percent between 5-14 years, 64 percent between 15-59 years, and 6 percent 60 years and older. The most commonly spoken languages at home in 2001 were Oshiwambo (37 percent of households), Afrikaans (22 percent), and Damara/Nama (21 percent). For those 15 years and older, in 2001 the literacy rate was 92 percent. In terms of education, 89 percent of girls and 86 percent of boys between the ages of 6 -15 were attending school, and of those older than 15, 79 percent had left school, 9 percent were currently at school, and 8 percent had never attended. The employment rate for the labor force (71 percent of those 15+) was 66 percent employed and 34 percent unemployed. For those 15+ years old and not in the labour force (24 percent), 35 percent were students, 34 percent homemakers, and 31 percent retired.